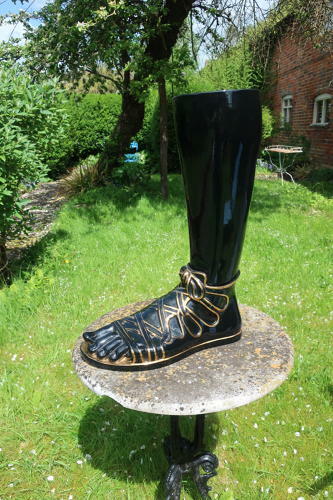 An iconic design by Fornasetti, in their typical Greco-Roman style a large and stylish umbrella or stick stand in the shape of a lower leg and foot in a Greek style sandal. In black with gilt highlights and made from glazed ceramic. Large and imposing design and a real talking point, very collectible piece of mid 20th Century design.